This Plainview point was described by Dr. Dan F. Morse as "an exceptionally finely made specimen which compares favorably with points found at the type site". He goes on to say "A variety of unifacial tools including end scrapers have been associated with Plainview. The Clearfork Gouge, somewhat analogous to the Dalton Adz, is also evidently associated with the Plainview Complex". This Plainview point was made from a high quality translucent honey colored chert. It measures 2 7/8 inches (7.2cm) long. Plainview points date to the Late Paleo-Indian and Early Archaic period (tradition) somewhere between 10,000 and 9,000 years ago and relate to a western bison hunting tradition. They were named after the Plainview site located in the High Plains of Texas where Sellards, Evans and Meade describe Plainview points in association with extinct bison. They are found over a wide area from Texas north into central Canada and from western Nebraska east to eastern Ohio. These points are Lanceolate in shape and are generally well made either with collateral (parallel) or random flaking. The bases are heavily ground and concave plus sometimes thinned. Isolated surface finds of Plainview points may not always be correctly identified. 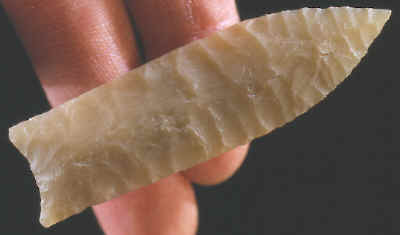 At the Rodgers Rock Shelter in Missouri both Plainview and Dalton points were found in the lowest levels along with fluted points. Some Plainview points may incorrectly be identified as a Dalton point. Some Goshen points from the Mill Iron bison kill site in Montana could also be mistaken for Plainview. As more sites are excavated and reference collections are expanded some of these identification problems may be worked out.